ABIDJAN, Ivory Coast - Ivory Coast's incumbent leader Laurent Gbagbo, who has refused to cede power, has accused world leaders of launching a coup to oust him. Meanwhile, the U.N. has warned Gbagbo supporters not to attack the hotel where his political rival is being protected by hundreds of U.N. peacekeepers. A Gbagbo youth leader has called for internationally recognized leader Alassane Ouattara to leave the hotel by Saturday. By midday, however, no Gbagbo supporters had shown up at the hotel to contest Ouattara's presence. The United Nations has said that the volatile West African nation once divided in two faces a real risk of return to civil war, but Prime Minister Guillaume Soro, a Ouattara ally, told reporters that the country is already at this point - "indeed in a civil war situation." "This is what's at stake: Either we assist in the installation of democracy in Ivory Coast or we stand by indifferent and allow democracy to be assassinated," Soro said at a news conference, adding that more than 200 people already have been killed and 1,000 others have been wounded by gunfire. Human rights groups accuse incumbent Gbagbo's security forces of abducting and killing political opponents, though Gbagbo allies deny the allegations and say some of the victims were security forces killed by protesters. The U.N. has confirmed at least 173 deaths. Gbagbo gave an address late Friday on state television in which he accused the international community of mounting a coup d'etat to oust him and said Ivorians were being subjected to international hostility. "No one has the right to call on foreign armies to invade his country," Gbagbo said. "Our greatest duty to our country is to defend it from foreign attack." The United Nations had been invited by all parties to certify the results of the Nov. 28 presidential runoff vote. The U.N. declared Alassane Ouattara the winner, endorsing the announcement by the country's electoral commission. But Gbagbo has refused to step aside now for more than a month, defying international condemnation and growing calls for his ouster. The European Union said late Friday that it had approved sanctions on 59 more people, in addition to 19 already sanctioned last week including Gbagbo and his wife. Gbagbo and about 30 of his allies also face U.S. travel sanctions, though such measures have typically failed to reverse illegal power grabs in Africa in the past. West African leaders have said they are prepared to use military force to push Gbagbo out, but are giving negotiations more time for now. For many, the credibility of the international community is at stake if it is unable to ensure that Ouattara takes power. Gbagbo points to Ivory Coast's constitutional council, which declared him president after throwing out more than half a million votes from Ouattara strongholds. The council invalidated election results in those areas, citing violence and intimidation directed at Gbagbo supporters. The top U.N. envoy in Ivory Coast has disputed that assessment. "All dictators are alike and all dictators will not negotiate their departure - they are made to leave," Soro said. "For the time being we are letting diplomacy do its work but when the time comes, each of us will assume our responsibilities." Soro was appointed prime minister under Ouattara's government, which has been holed up in the Golf Hotel under U.N. protection despite its widespread international recognition. Soro, a former rebel leader from the north, served in a coalition government with Gbagbo but is now aligned with Ouattara. Meanwhile, a pro-Gbagbo youth leader has encouraged his supporters to seize the Golf Hotel, saying that Ouattara and Soro have until Saturday to "pack up their bags" and leave. The building is being guarded by some 800 U.N. peacekeepers and hundreds of rebels loyal to Ouattara. U.N. Secretary-General Ban Ki-moon has said he is "deeply alarmed" by the youth leader's comments, and he has called on Gbagbo supporters to "refrain from such dangerous irresponsible action," a U.N. spokesman said. The youth leader, Charles Ble Goude, is known as the "street general" for organizing a violent anti-French and anti-U.N. gang that terrorized the foreign population in Ivory Coast in 2004-2005. Human rights groups have warned that security forces loyal to Gbagbo have been abducting political opponents in recent weeks. The United Nations, citing witness reports, believes up to 80 bodies may be inside one building nestled among shacks in a pro-Gbagbo neighborhood on the outskirts of Abidjan. Investigators have tried to go there several times, and even made it as far as the building's front door before truckloads of men with guns showed up and forced them to leave. A second mass burial site is believed to be located near Gagnoa in the interior of the country, the U.N. said. Gbagbo's government has repeatedly denied the existence of mass graves. "Denying access to alleged mass grave sites and places where the victims' mortal remains are allegedly deposited constitutes a clear violation of international human rights and humanitarian law," U.N. High Commissioner for Human Rights Navi Pillay said. Pillay also warned that those committing human rights violations at the direction of others could also be held accountable. "They, too, have a direct individual criminal responsibility for their actions and omissions," she said. "It is no excuse that they may have been merely carrying out orders, directions or instructions from above." Ivory Coast was divided into a rebel-controlled north and a loyalist south by a 2002-2003 civil war, and the long-delayed presidential election was intended to help reunify the nation. 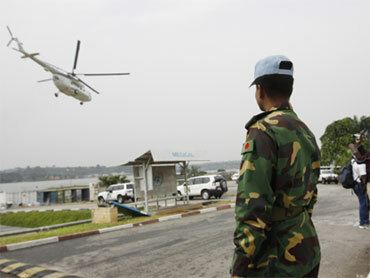 However, tensions over the outcome have sparked violence including several attacks on U.N. peacekeepers. Ivory Coast, the world's top cocoa producer, was officially reunited in a 2007 peace deal. However, Ouattara still draws his support from the northern half of the country, where residents feel they are often treated as foreigners within their own country by southerners. A high-level West African delegation is expected to return to Abidjan on Monday. Col. Mohammed Yerima, director of defense information for the Nigerian military, said that defense chiefs from the 15-nation regional bloc ECOWAS met Friday to begin strategizing what sort of assault they'd use if those talks fail. But his comments appeared to suggest no such attack was imminent, as he said the plans would only be presented to ECOWAS leaders in Mali in mid-January.